Was I California Dreaming Or Did I Have Lunch With Stephanie Honig?? It’s no secret that I am not a huge fan of any wines coming out of the state of California and a big fan of the quality to price ratio wines from the state of Washington. In addition, every California Wine I have been tasting in any price range including the so called BIG GUNS all taste the same: Overoaked, Overalcoholed, Short Finishes, Residual Sugar and most importantly waaaaaaay over priced! Other than those reasons, I love them!!! As a Certified Sommelier, and writer of this blog, it is my duty to constantly taste wines from all over the world including NAPA VALLEY and SONOMA and give them a chance because you never know. Many Wine Distributors are afraid to bring Winery Owners to see me or sample me on their wines because they know I don’t play favorites to anyone and I will give an honest opinion that many times is not very positive. As a man living on a tight budget, I can’t say NO to a FREE LUNCH and some FREE WINES and the opportunity to meet a Winery Owner from anywhere. I was invited by my Distributor Representative Cynthia, to have lunch and sample some wines from the dreaded NAPA VALLEY and meet Stephanie Honig, Wife To Michael Honig (The Man who took over the Honig Winery in Rutherford at age 22 from his grandfather Louis who died in 1984)and mother of 3 children and in 9 more weeks at the time of this writing is about to be a mother of 4 children!! NO I AM A PROFESSIONAL, I AM NOT JUST A SUCKER FOR A PRETTY FACE. Stephanie’s mother still lives in Fort Lauderdale and Stephanie was an F.I.U. graduate and a really nice woman. Alright enough sucking up, let’s taste some wines. 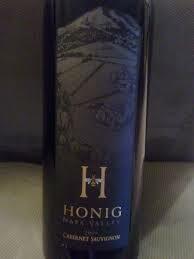 It was interesting to me that up until 1989 Honig Winery only produced Sauvignon Blanc and then they started to include Cabernet Sauvignon as well. In case you are dying to know, I had the Pesto, Chicken Salad Sandwich on fresh Ciabatta Bread. After all, I wasn’t expecting to taste anything good out of California and I just came for the Free Lunch so I thought you would be interested in my menu selection. 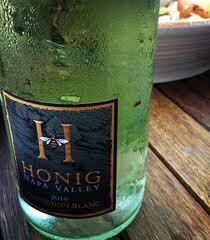 We started off with the 2013 Napa Valley Sauvignon Blanc. Right off a couple of sniffs and I started to pay attention and put down my sandwich. 99% Sauvignon Blanc with 1% Semillion this nose didn’t smell like other Napa Valley Sauv Blancs it had a nose of the Loire Valley and a Pouilly Fume. This Fresh and Bright Aromas of Passion Fruit and Soft Citrus not New Zealand hit you in the face with a grapefruit citrus but elegant Citrus woke up my brain. On the palate I always expect California Sauvignon Blancs to be Fruity Tooty and Sugarfied but this Sauvignon Blanc that was aged 100% in Stainless Steel was balanced and elegant and very crisp with a nice mineral finish but I could have drank the whole bottle with lunch by myself. It was refreshing, well made and the alluring notes of tropical fruits such as mango and the very soft citrus….. I have to tell you is a phenomenal Sauvignon Blanc at half the price of what you would pay for a Loire Valley Wine. Ok, Stephanie, you got my attention. This must be California Dreaming?? I am sitting and having lunch with Stephanie Honig, sampling California wines and loving them?? Not to mention how good that Sauvignon Blanc paired with my Pesto, Chicken Salad Sandwich. In South Florida, that Sauvignon Blanc that I tasted would be my personal first choice of Sauvignon Blancs to drink everyday. The Cabernet Sauvignon was the most balanced, elegant Cabernet From Napa Valley that I have sampled in years. The one thing I will disagree with Stephanie is she told me that the Cabernet Sauvignon was TYPICAL NAPA VALLEY in it’s flavor profile and style. I would say the 2012 is TYPICAL WASHINGTON STATE COLUMBIA VALLEY In Style but produced in California’s Napa Valley. An amazing wine tasting a terrific woman and a great lunch. I have to be True to myself and my readers. As much as I genuinely loved all the wines and the 2012 Cabernet truly is Amazing, I can guarantee you however, that I could find a wine with almost identical flavor profiles and quality from WASHINGTON STATE at about $30 less money on a Restaurant Wine List however both these Honig wines should be on Any Sommelier’s Wine List As they will be on Mine!! Cheers Stephanie Honig!! PreviousROSE is not a 4 Letter Dirty Word And THEY ARE NOT SWEET WHITE ZINFANDEL!! NextMy Life Long Mission: Get Americans To Drink More Rose!! !